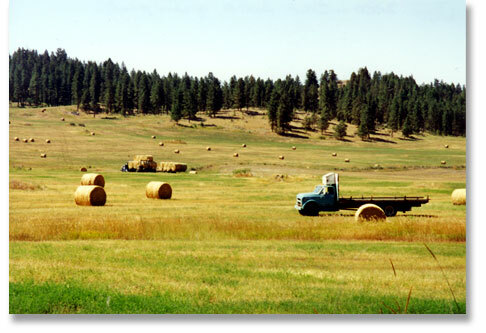 Oberg Brothers Ranch is located near Havillah in the Okanogan Highlands. 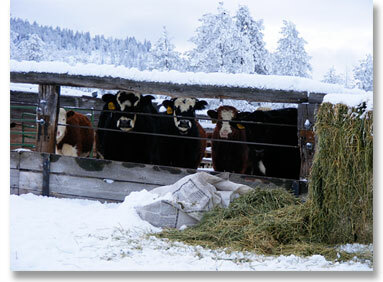 We have been raising Hereford and Hereford / Angus cross cattle for over sixty years. Our ranch is BQA certified (Beef Quality Assurance), providing quality ranch management to ensure humanely raised, safe and healthy cattle / grass fed beef for our customers. We have a fall and spring calf operation, so our spring calves are born in March thru April. And our fall calves are born in September thru November. In the winter we feed them our own hay that we put up in the summer. 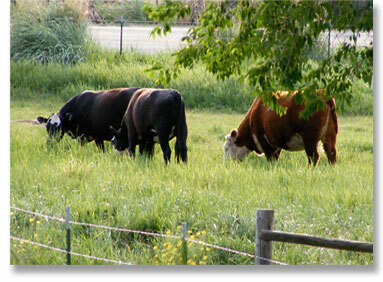 Starting in April, and running through October, they graze on our grass pastures and range lands. We use straw often to bed them in the winter, and plenty of fresh water is always available. Starting in November, they are fed dry hay, which we produce. For customers who purchase our custom beef, the animals are given a small amount of grain mix (GMO free) for 30 to 45 days, along with their regular feed, grass or hay depending on the season. We have this mix especially made for us with a little molasses. It looks like granola and the animals love it! The beef is lean, healthy, and has a delicious flavor. If you prefer grass fed only, please specify at the time of the order, we can do that too! 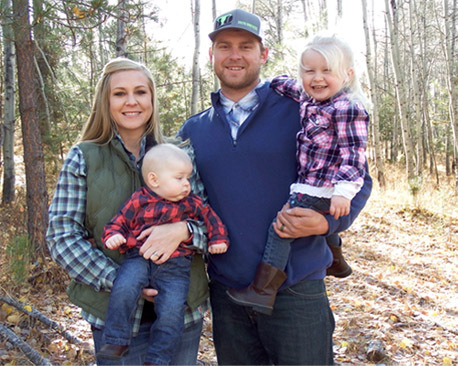 We are happy to announce new partners on the ranch! Our son and his wife, Sean and Heather Timmerman. Our Youngest Cowboy and Cowgirl! We are now taking orders year round ... pre-orders are taken in advance for Custom Beef to ensure availability. These prices include all the processing fees, cutting and wrapping etc. ! The quarter is a mixed quarter (limited on choices)...you will get a little bit of everything ... New Yorks, Tenderloins, Rib Steaks, Roasts, Hamburger, etc. Please note: The actual wt. of beef is around 55 to 65% of hanging wt. depending on how much you have deboned and ground. This figures to around $6.25 per lb. for everything once it is in your freezer. We request a $100.00 on 1/4 $150.00 on 1/2 and $300.00 security deposit on 1 whole beef, which will be applied to your purchase. (You may make additional payments) and the balance is due once we know the hanging weight of your beef. Our beef is professionally cut & wrapped to your specifications by our local butcher, Double S Meats in Tonasket. You can have the best steaks & roasts and the rest ground; or you can get all the traditional cuts. The choice is yours . You choose how thick you want your steaks and how many in a package. It's customized just for you! Click on the “BEEF MAP” above to get more info. on the Cuts of Beef provided in the “BEEF MADE EASY” flyer by the National Cattlemen’s Beef Association and the Beef Board. There also you will find our Guideline of what kind of cuts and how many of those cuts you would normally get in a typical half beef. Tina will be happy to help you with your cut and wrap information when ordering your beef. The beef is dry aged for 15 days which adds tenderness and flavor. This is something that has become a thing of the past, and could be considered one of the biggest factors in the decline of the quality of retail beef. We deliver year round (providing there are good road conditions) to the following locations:Wenatchee, Leavenworth, Everett, Burlington, North Bend, Colville, Spokane and towns in between. There is a minimal charge per order for delivery. 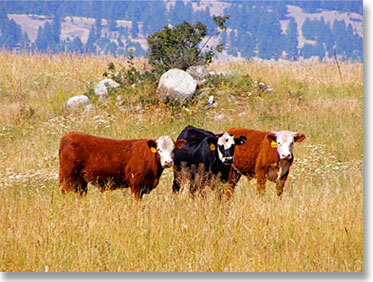 Our beef is safe, healthy and natural. 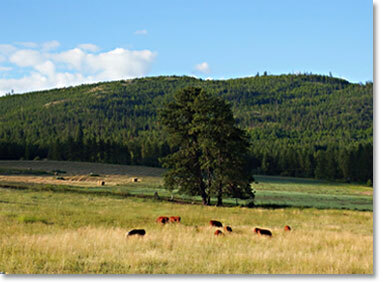 We love this ranch and care about the cattle we raise. 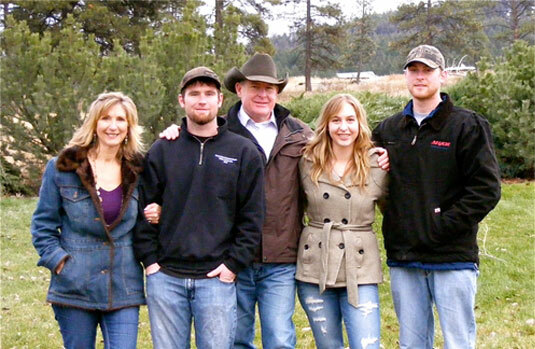 You may like to follow us on Facebook to see what is happening on the Ranch! Thanks for looking us up !